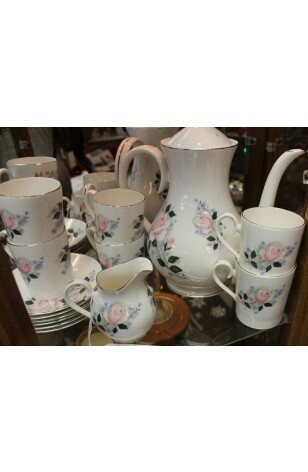 Vintage - Mayfair Fine Bone China of England, Pink Rose Pattern, Coffee Service for (6) Six, (15) Pieces, Circa 1950's. This beautiful Mayfair Bone China Coffee Service for Six is in a White Background, with Pink Roses and Blue Flowers, Dark Green Leaves, and Gray used as an Outline of the Roses. All Pieces are Trimmed in 22kt Gold. This is a Beautiful Classic Coffee Service from the Mid-Century (1950's), which anyone would be proud to own, and use.. Good Condition. This beautiful Mayfair Bone China Coffee Service for Six is in a White Background, with Pink Roses and Blue Flowers, Dark Green Leaves, and Gray used as an Outline of the Roses. All Pieces are Trimmed in 22kt Gold. This is a Beautiful Classic Coffee Service from the Mid-Century (1950's), which anyone would be proud to own, and use.. Good Resale Condition unless otherwise noted below or in pictures. 6 - Saucers - 5"